Turn around time for online ordering is two business days. order your thanksgiving pies below! and corporate gifting made easy! 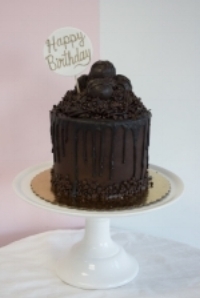 you can now place an online order for our Drip Cakes and Fancy Cakes. Fondant Plaques are not included. 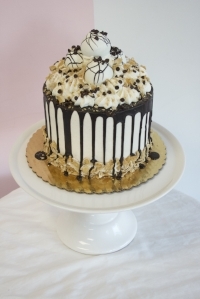 To develop a quote for your custom cake you will need to know the number of servings to begin. Every custom cake is individually priced. For reference, Buttercream Cakes start at $3.00 per serving and Fondant Cakes start at $5.00 per serving. Sculpted cakes, figures , flowers and decorating time are all extra. We recommend 1-2 weeks advance notice to place a custom order. A 30% non-refundable deposit is required to confirm an order. You can order an assortment of our daily selection or choose our plain flavors and customize them with colored buttercream and sprinkles! We stock an assortment of flavors daily, which you can choose to order here or stop by the shop and pick from what we have! You can also order our 4 basic flavors baked fresh daily, and customize colors and toppings! Cupcake toppers are not available to order online, and are an additional cost! 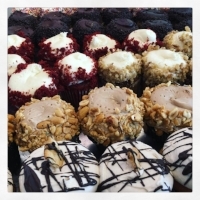 Order Cake-Pops or Cake Balls! Cake-Pops are $30 per dozen, they come dipped in a vanilla flavored chocolate, chocolate or other flavored chocolate. They also come individually wrapped and On-A-Stick! Please limit flavors to one or two per dozen. Some flavors come in a standard color and cannot be changed. Writing and shaped or themed cake pops are available at an additional cost. Cake-Balls are $20 per dozen, they come dipped in a vanilla flavored chocolate, chocolate or other flavored chocolate. They do not come individually wrapped! They also do not come On-A-Stick! Writing and shaped or themed cake balls are available at an additional cost.